Found b&w late 1890's cabinet card of a god-fearing, crucifix wearing Texas rancher. 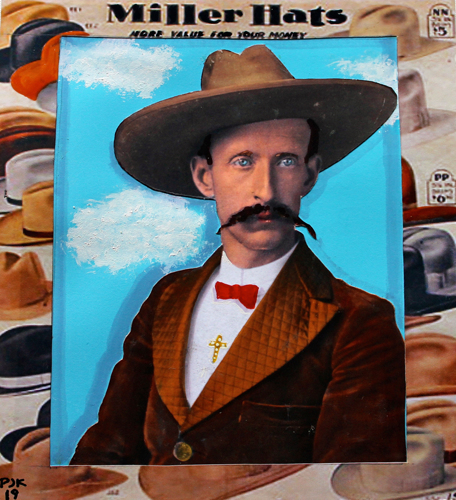 It was enlarged, cut out and colored with photo dyes, markers, acrylics and then mounted on a painted scene (acrylics) and glued to an early [color-enhanced] advertisement for Miller Hats. In 1918, Philip Miller was sent to Denver from N.Y.C. by his hat-making brothers. His job was to open new sales territories for the family business. He had with him a sample case of Miller Brothers cowboy hats. He was highly successful and soon established his own Miller Hat Co. Traveling throughout the Rockies and Great Plains, he called on small town stores and remote ranches. Cowboys were having trouble getting hats and other ranching necessities in the still somewhat wild West.Miller filled that need. He published his first catalog in 1923. The ad is typical of his early catalogs.